Why turbocharge? What’s so special? These are common questions asked by those who have never experienced the power of a Turbocharger. Back in the 1980s almost all of the world’s Formula One race teams had turbos fitted for one major purpose. A higher increase in power output from a much lighter and reduced sized engine, controlled by the ratio of air to fuel. Also nobody wants to lose a large amount of the power from the engine simply to propel the excess weight down a road, or to have huge vehicles just to carry normal loads. Not only do turbos offer more power for a vehicle it also increases speed and much better handling compared to any conventional naturally aspirated engine. A turbocharger provides fantastic overall responses including reliable reserves of power when you need it. Don't believe us? We can prove it with a brand new hybrid turbocharger; find yours on our webshop today. In the early years when diesel engines were introduced, there has always been a certain demand for smaller engines which are more than capable of producing its maximum power. However this does not bode well with the present environmental issues that are currently occurring. There are currently issues with lead pollution etc., plus the economics of a diesel engine user however by installing a turbocharger can dramatically assist in the decrease of vehicle pollution and play a major part in being greener. A naturally aspirated engine, under normal circumstances will increase its engine power output by 30% when the right turbocharger is installed. Basically, it’s the exact same size engine giving more power which is used by the operator. Back when turbochargers were fairly new it was vastly common practise to install a turbo to a naturally aspirated engine. However now a days turbo engines are designed to take into account the mechanical and higher stress thermal loadings placed upon the engine and other ancillary parts by the turbo. Still wondering why to turbocharge? Well feel free to contact a member of our technical team who will be more than happy to answer any questions or queries you may have. Email Us today or call on 01202 487497. Simply a supercharger is connected with a belt from the engines crankshaft. Its pulley, which is what makes the supercharger spin forcing air into the engine spins only when the engine spins. What determines the boost pressure comes down to how large or small the pulley is. The smaller it is the more boost the engine will receive. However this has its down sides. The supercharger is vastly limited by its efficiency as since the engine drives the supercharger it needs to use horsepower to make further horsepower. Also if you over boost the supercharger it will push hot air into the engine its connected with causing it to over boost as well as numerous other issues. Turbochargers are similar to a Supercharger but far more efficient and its boost output is not determined by the engine but by the vehicles exhaust gases. The exhaust gases runs through the turbine housing causing the compressor wheel to force compressed air into the engine. Thus meaning your engine is not working nearly as hard as a supercharged engine and as a turbocharger is not connected directly to the engine it can spin much faster. A question that is commonly asked in the current Aftermarket is “I’m looking to boost my engine do I supercharge or turbocharge”? 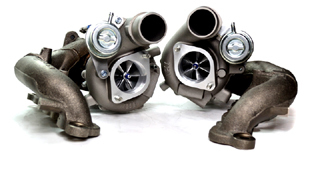 Unfortunately this is not a simple and speedy answer but we can take a look at certain critical features that make the Turbocharger the most economic, power enhancement ever to be installed on your vehicles engine. Firstly turbos are far more durable. A turbo simply just has one moving part, being the rotating assembly. Whereas the Supercharger has pulley’s, belts or even a geared transmission, making the Turbocharger a much simpler system with far fewer things to go wrong with it. A Supercharger has high parasitic drag due to the power originating from the crankshaft however turbochargers use energy that is otherwise wasted through the tailpipe. Currently Garrett’s state of art compressor and turbine aerodynamics push the technological boundary flow range and stage efficiency. Want to push the limits whether your specific goal is a mild street application or full blown drag racer, a turbocharger is equally appropriate. A correctly matched turbo can provide superb response and the ability to run boost levels most dream of.